We live in "interesting times" to quote a Chinese curse. Never have there been so many people chasing so many diminishing resources. 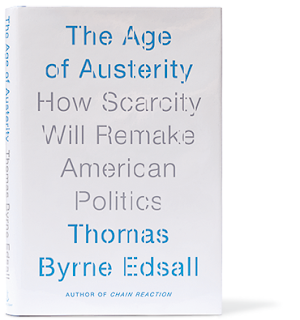 Thomas Byrne Edsall compiles a bunch of statistics with some observations to demonstrate that austerity is having an impact on American politics. Demographics are a driving force. In America the trends are that minorities are gaining at the expense of whites. However whites are still in power and are reluctant to give it up. The elderly whites feel especially threatened and resentful. Basically those who have power do what they can to retain it and if possible expand it. When things get scarce greed and fear are revealed. It isn't just physical resources that are getting scarce. It also includes such things as jobs and available money for the masses. The safety net is under assault. Language is a tool in the battle. The word "entitlement" has come to mean undeserved and the Republicans have used it in that sense so often that Democrats find themselves using it as well. The author seems pessimistic thinking that the main thing going for the Democrats is that the Republicans tend to overplay their hand. The Republicans are conscious that demographics are working against them and feel some pressure to achieve their goals while they still can. The author is sympathetic to Democrats, but doesn't think they are as unified as they need to be and that for the moment the Republicans have the edge. The very specific thrust of the Republicans is to lower taxes and lessen regulations. What this accomplishes is to consolidate their power. They are very resentful of their hard earned wealth going to the undeserving. They overlook that in the future the greater numbers of elderly will be dependent on the efforts of the greater numbers of minorities. Inequalities are natural in capitalism, but at some point those in power are able to leverage a greater gap. Demographics are working against the Republicans and so they feel a sense of urgency. They know that Latinos, African Americans and other minorities will soon have the numbers to advance a progressive agenda. But the problem cannot be confined to the United States. Americans only make up 5% of the world's population, but consume 20% of the world' energy. The rest of the world is trying to catch up. A quote found in the text from Francis Fukuyama, "One of the benefits of democracy is the ability to legitimately extract from elites." In many despotic countries of ancient and contemporary history this ability does not exist and all (including the very rich) lose something. The author has laid out some frightening trends. Whether there might be sufficient counter trends it is difficult to determine. 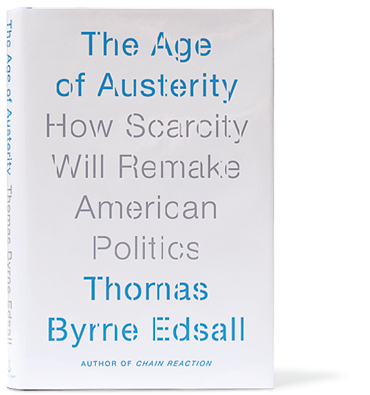 I think those concerned would do well to read this book and become more conscious of some very significant scary trends. I am not the best example of a Stephen R. Covey student, but he provided a good model. I have read several of his books and listened to many of his tapes many times. I think a lot of people were similar to myself in that we wanted to follow his path, but just somehow didn't quite make it. Still I know I am better off for the effort and haven't yet given up. His death this past week has made me want to review what he had taught me. He left a legacy to benefit anyone who cares to make an effort to understand. "The Seven Habits of Highly Effective People" is one path to being more effective. Based on studying the characteristics and habits of people who got things done. Habits are the key. We all have them, but they aren't necessarily the healthiest of habits. Running down the seven habits helps focus on how we could all get more out of life. The first habit is to be pro active. Most of us react to whatever happens to us. We blame others if things don't work out. Covey feels you must make the decisions that affect you as much as possible and take responsibility for your actions. The second habit is to begin with the end in mind. What this boils down to is to have a purpose in life with goals that are important to you. Most of us don't think about whether we have a mission in life or how we would like to be remembered. Covey highly recommends you give a lot of thought to what you want to have accomplished by the end of your life. That should be reflected in everything you do. The third habit is an outgrowth of the second. As much as possible you should always be doing something towards what you have identified as important to you. Instead we spend much of our time dealing with problems that demand immediate attention or on things that really don't matter. Thinking this out (and I do try to do this each week) you should work towards your goals and when you are not able to do anything towards the most important one think of your next most important goal or think of some small step towards your highest priorities. I was surprised to realize that this doesn't require frantic activity 24 hours a day as Covey recognized that rest and regenerating yourself were just as critical as any task. If a matter is really urgent you cannot ignore it, but if you carve out more and more time for the really important you will need to spend less time on the urgent and the trivial. Moving to the fourth habit comes a recognition that to get things done we have to deal with other people who have their own set of priorities. Whenever you feel you need to get something from another person you need to think what they could get out of helping you. Win-win is the goal. If one of you loses, even yourself the exchange is not in the long run successful. The fifth habit is a very key one. We all want to be understood, feeling that if the other person understood you they would give you what you want and deserve. We are so wrapped up in this that we make little if any effort to understand their viewpoint. Stephen urges, "Seek first to understand, then to be understood." Encourage the other person to express their concerns and don't interrupt except to express understanding or encourage them to continue. When you understand them it makes it much easier to move forward. It is important to be understood, but much easier for them when they feel they are understood. The sixth habit is to synergize. Working as a team we can accomplish a whole lot more than doing it ourselves. The whole really is greater than the sum of its parts. The seventh habit is to "sharpen the saw." Stephen uses this metaphor to point out that we need to have balance in our lives and need to renew our skills. One basic idea of being more effective is to realize we live in an interdependent world. I have paraphrased his thought that when we are born we are totally dependent on others to survive. As we grow we gradually become more and more independent. Full growth occurs when we realize we have always been inter-dependent. That idea seems very relevant with the political campaigns ranting about the issue. There is a strong streak in America (and to a lesser extent elsewhere as well) that the strong self made man is the ideal, the model for the rest of us. It is a self serving delusion of some successful people. One candidate talks about unleashing business and that any restrictions are very harmful. Another candidate seems to feel that we can get more done if we work together. Many people feel that restrictions (ie. regulations) do more harm than good. Some people feel that we shouldn't hold back the strong people in any way and that those who aren't strong should not be allowed to mooch off the successful. I am from the school that believes nobody got to where they are by themselves. Obviously it helps to have parents that passed on strong genes and healthy nurturing. It helps that schools (formal learning facilities) allowed you to develop knowledge and skills and perhaps stirred your imagination to see new solutions to old problems. It helps that many people combine their efforts to provide easy means for you to communicate and get around. For most of us we live in a relatively safe environment that lets us grow stronger. Today it can be helpful that we are much more conscious of and can take advantage of global interaction. At bottom is the need for someone to buy what you are selling. We are all selling something and many of are paid off with salaries, commissions, rents, etc. Some of us are selling ideas and they need believers. There will be many people praising the contributions of Stephen R Covey. I just wanted to add that even a relatively unsuccessful blogger is better off for having read and listened to Stephen R Covey and firmly believe the world would be better off if more people followed his teachings. As an outsider (in the sense of not being Jewish and not having ever visited Israel) I can easily be accused of ignorance. On the other hand we all benefit from understanding what outsiders think even if they are totally wrong. I grew up thinking of "Exodus" as one of my favorite movies, however as I got older I became aware that it represented only one viewpoint. I am now aware of other viewpoints. Peter Beinart, who I have found in other contexts to be intelligent and objective has more of an insider perspective on Israel and is very concerned. Peter might be described as a liberal Jew who sees Israel as not treating Palestinians fairly. Most Jews in the United States seem to vote Democrat, but because they tend to be liberal they also tend to inter-marry more and are losing their Jewish identity. Other Jews, especially older ones see themselves as victims and view Israel as a possible refuge or at least as a beacon. The author is concerned that Israel is losing its democracy. Many Israelis emphasize that they are victims and don't realize that they now have power and are using it to impose hardship on others. A significant segment of American Jews support the right wing approach which essentially is to keep the Palestinians from having their own state. Many of those who feel more liberal are gradually losing their identification with Israel. Beinart is concerned that the current Israeli government is turning the world against Israel. Including the occupied lands Palestinians are likely to become more populous in the near future and this will force a difficult choice. Will Israel remain Jewish and will it also remain a democracy? Barack Obama has a personal perspective on Jews which surprised me. One of his early mentors was Arnold Jacob Wolf who believed Israel and American Jewish organizations had to be democratic and felt Jews should de-emphasize victim-hood. Some liberal Jews were closely tied to Obama's education and to his political rise. Obama spent part of his upbringing amongst Muslims and is well read on their perspective. Beinhart thinks Obama was out maneuvered by Netanyahu and sees danger. Benjamin Netanyahu has a different vision for Israel and its role in the world. He sees the Palestinians as an obstacle to Israeli and Jewish security. The settlements in the west bank are seen as a necessary and desirable move although Palestinians and many others see them as a threat to peace. There is a feeling amongst some hard liners that Jordan was taken away from them. Evangelicals, particularly in the United States have an influence on the dynamics. They believe Christ will come back, but only while Israel is ruled by Jews. Several years ago at one of my jobs I had my eyes opened by a fellow worker who I respected that the second coming was moving forward and would take place in Israel. 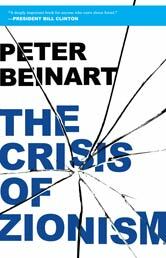 It is all very scary, but I believe Peter Beinart has a valid perspective that should be seriously considered. My sister Rebecca in Brossard, Quebec fed me and provided a place to sleep during my many trips to the Maritimes. It is embarrassing to recall that when she was living by herself before having children my father and some of my siblings visited her. Years later she mentioned how important that was to her as she didn't know many people in Montreal and her husband Ali was out of the country. I didn't visit, with my only excuse being I was busy doing other things. I felt we had a good relationship, but it was mainly because of her efforts visiting her family in Ontario. When it became self serving such as trying to save some hotel expense on a trip to the east coast it became easier to visit. Both Rebecca and her husband Ali were very hospitable, in fact setting a standard few people would match. As years went by and I had to travel back and forth to the east coast I made more visits. Ali suggested that even though I didn't speak French I would have an easier time trying to sell in Quebec than a francophone would in Ontario. In fact I used to set the alarm for around 3 a.m. so I could make it to Fredericton before it was too late in the day to make a sales call in English. Driving past a population base of millions for the opportunity to sell to a population base of hundreds of thousands doesn't seem the best use of gas and time. I had earlier signed up a Quebec veterinarian wholesaler with national distribution, but had only approached affiliated Ontario and Maritime clinics. As time went by there developed a few other links. Jacques Major, a fellow employee at OKD, wrote an introductory speech in French. Later he helped me adapt a story I told to win favour with receptionists. I boned up on a few French words and was supported by French labeling and literature. Calling mostly on veterinarians I was pleased to learn that there was usually at least one person reasonably fluent in English and often it was the veterinarian owner. Speaking to the chief decision maker was not nearly as common on my other calls so this became a bonus. There wasn't smooth sailing all the time. I stumbled on lots of calls where I didn't make myself understood, but really only had one very negative experience because of my poor French. I won't go into that, but every salesperson who makes cold calls has to deal with fear of rejection or of looking like an idiot and my Quebec experience provided a lot of realistic opportunities to deal with that. My first call was on the south shore off Quebec City in Levis and it turned out to be a difficult French conversation. I had been trying to relate how effective our solution was to get rid of skunk odours. When I followed up they had actually bought my product as a floor cleaner and were very pleased. I ran into many English speakers of various levels of fluency and mostly made myself understood. I was moderately successful not only in increasing sales, but actually picking up stories of successful users that helped me in other markets. Eventually I called on well over 200 Quebec clinics. As an outsider to Quebec I had very vague ideas. I knew Montreal was a major cosmopolitan city. I knew Quebec City was a popular tourist destination. I had heard other names, but they held no uniqueness for me. Like any other province of millions of people Quebec has lots of unique (and very interesting) identities. At one point I did more than just make calls along the route to the Maritimes, but actually spent a week at a time in Quebec. From Rebecca's house I could make calls to about a three hour driving range that included Quebec City and Sherbrooke. I went beyond that staying overnite in motels visiting Lac St Jean. On trips to Ottawa I visited Gatineau. On trips to northeastern Ontario I visited Rouyn Noranda. I started to realize and enjoy that Quebec culture is very rich. I listened to Celine Dion in French, but also learned of other Quebec singers. I have since realized that a lot of Quebec movies are first class and enjoyable. Starting where my sister lived, in Brossard. It was part of a string of communities that are grouped as the South Shore. I was impressed with the local library and the system of walking trails. I was dragged to a lot of shopping areas and found many of them enjoyable. I had my car's oil changed at a particular fast lube place on three different trips in Brossard. I eventually spent time selling on the north shore (which included Laval where I had sold some other things on the phone). Favorite places included Sherbrooke, Victoriaville, the Beauce (south of Quebec City), Riviere du Loup. I was able to circumnavigate Lac St Jean and wished I could have done it more slowly. Ali had biked around the lake as a university student. Quebec City is one of the most interesting cities in all North America and I am glad I was able to go back without the pressures of sales calls. Montreal is a cosmopolitan city with a lot of interesting things--one that comes to mind is the market on Jean Talon. The South Shore is also a very pleasant place. This brief list of names by no means exhausts all the beauty of Quebec. One of the biggest legacies came from a trip to Quebec City where I had a limited window because of commitments to travel elsewhere. I had mapped out my calls to veterinarians and was curious about the proximity to some tourist attractions--old Quebec and the Montmorency Falls. 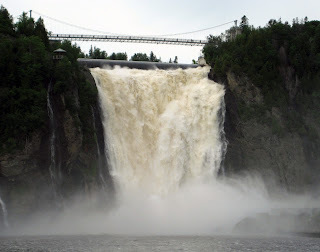 I felt railroaded in a morning rush hour and ended up going through old Quebec and then later looking for a clinic to the east found myself driving by Montmorency Falls. I knew I had missed a turn and had to turn around. At that point I noticed Ile d'Orleans. It just looked like a lot of trees, but people were driving over the bridge. My curiosity was aroused. When I got back home I did some research and became even more fascinated. For one of my milestone birthdays my wife asked me what I wanted. I decided it would be nice to visit my sister in Brossard and make a holiday of it. I was no longer visiting Quebec on business. I suggested we could go to Quebec City. Even then I was planning on a side trip to Ile d'Orleans. We stayed in a Quebec City motel and of course visited the famous old Quebec. I felt like I was dragging my wife to Ile d'Orleans and was very disappointed at my first two planned stops as they were not open or we couldn't locate them. I was ready to admit defeat, but my wife's attitude was we were already there and might as well continue to circle the island. Her boss had once done a bicycle tour of the island. The next stop less than ten minutes later (and not planned) turned out to be very delightful. It was a bakery with very different and wonderful pizza. Further down the road we ran into some boutiques and then a fabulous chocolate place. We bought some local wine. We had dinner beside Montmorency Falls which was another wonderful meal with a beautiful view. A year later we decided to spend 4 days on Ile d'Orleans at a bed and breakfast and thoroughly enjoyed it. Back in Montreal my sister gave us a tour of Montreal that would have been more enjoyable if I wasn't so tired. Did have some of the famous Montreal bagels and saw old Montreal. When I go on my sales trips I don't always see the most scenic sections. Talking to Peter Cotton (my cousin Donna Stewart's husband) I started to tell him where my favorite drive was and it turned out we both agreed on a road to Beloeil, just off the Trans Canada Highway. Something about the particular houses along the river. Peter had been involved with the design of some restaurants along the harbour in Halifax that I also enjoyed. While staying with my sister's family I got involved in some of their routine. On several occasions went on long family walks. I remember on a couple of occasions going with my niece Leila delivering newspapers in the morning (something I had done a great deal of in a previous job). Leila helped me visit a Montreal cat show where I couldn't always make myself understood. Samia, my sister's other daughter had developed an interest in Tae Kwon Do. I had picked her up from a practice and attended one competition. That developed into a passion for both Samia and her mother, both of whom got black belts. Samia has competed at a high level internationally. I also remember enjoyably socializing with friends who had originally come from Ali's home town of Safi in Morocco, both at their home and my sister's. As usual they were all at least tri-lingual including their 5 year old son who couldn't understand why my French was so poor. He thought everyone in Canada spoke French. One year I was invited to attend an Eid dinner which is the traditional end to Ramadan. Often I got to enjoy some really good Moroccan cuisine eaten in a unique style, plus other interesting menus plus an impressive tea ceremony put on by Ali. I like to think of myself as an opportunist. We all think that if only the right opportunity would offer itself our fortune would be made. It happens for some people. What most of us do not always realize is that there are always opportunities and some of them are mind blowing. But we aren't always looking for them so they either go unnoticed or sometimes sooner or later someone else discovers them. I am glad that I took an opportunity to explore Canada's most unique province and get to visit my sister's family more often. I owe it to my brother in law, Ali who encouraged me with his one observation and his many acts of hospitality. The photo at the top is of the bridge going to Ile d'Orleans. I probably never would have seen it if I had not missed a turn and realized it when I saw the Montmorency Falls. My wife, Sharon took that one. The second photo is at a bed and breakfast in Ile d'Orleans where we met two couples from Brooklyn New York that were very enjoyable company. The photo at the bottom is Montmorency Fallls which is actually higher than Niagara Falls, but much narrower. You can see a pedestrian bridge over the top of the falls which my wife walked across. Libraries are an important part of my life. I was fortunate to learn about the "One Book One Burlington" program and decided to investigate their choice for 2012. 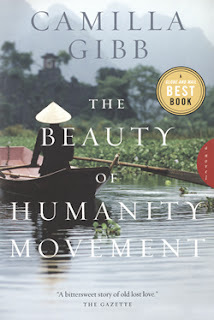 "The Beauty of Humanity Movement" by Camilla Gibb is one I had not heard of, but librarians have earned my respect. For me, a white older male, this book brings a new perspective. When I first went to university I remember one fellow student who told us he was at a Canadian university to avoid the draft. For years I have enjoyed listening to Andy Barrie who also came to Canada to avoid the draft. Since those years I have met a few Vietnamese--at the farmer's market where I buy mangoes and fish, some neighbours, one of my favorite sandwich places, Bahn Mi Excellence. Nelson DeMille, a relative on my wife's side spent time there and has written about his experiences. Today the war seems forgotten. When we think about it our thoughts are jumbled. A lot of us think the Americans made a terrible blunder going where they had no real understanding. We feel the war did bad things to the Americans and they in turn did bad things to the Vietnamese. This book brings out that bad things were done by Vietnamese to other Vietnamese. Now Vietnam is moving forward. We are soon introduced to Maggie who is collecting art in Hanoi, but also trying to learn what she can of her father. Maggie's father had been an artist in Revolutionary times. Revolutionary leaders and their lackies recognize all forms of art can either reaffirm the Revolution or undermine it. Maggie's father was identified as a dissident and was tortured, but escaped. Later he was able to get his wife and daughter out of the country, but he disappeared. Maggie mostly grew up in Minnesota, remembering her father became interested in art. After much effort she locates Hung, an elderly pho (soup) maker. He reacts to some of what she says, but cannot recall the critical details. Over the course of the book we learn of his connection to some earlier artists. He has his own interesting history but at the time of the story has been sort of adopted by a younger family. Gradually some memories are re-discovered and some misunderstandings unraveled. A focus of the book is a soup called Pho. You may have noticed a few restaurants specializing in pho in many Canadian cities. Several years ago I tried one and found it an interesting experience which I didn't really understand. I could see it as a gathering place similar to coffee houses. The soup is a collaborative result of French and Vietnamese with endless variations, but requiring a great deal of attention. The social aspects of the soup help bring the story characters together. For me the joy of the book was in revealing an interesting part of the world I have over looked. The plot and characterizations made it compelling reading. Having finished the book I had to try some Vietnamese soup to better understand how it could be such a magnet. I chose to visit Thai Avenue which is close to the Burlington Public Library. The waitress was helpful and soon provided me with a large bowl and explained some small details to make it more enjoyable. I opted to use chopsticks although not very deft with them, I find it slows me down so I can appreciate the food better. It was filling with a lot of flavour. I had chosen one with beef, but also lots of noodles, sprouts and onions. I enjoyed the broth as well. If you would like to try what they have to offer you can learn more on their website: www.thaiavenue.ca/ Don't worry they will also offer you a fork and spoon. I read "The Price of Civilization" as I had enjoyed the other Jeffrey Sachs book my son Michael recommended, "The End of Poverty." The title comes from a saying of Oliver Wendel Holmes who felt taxes were the price of civilization. We could live in a world where the law of the jungle prevailed, but there would be a lot missing. For instance a lot of what we call infrastructure would be missing. Roads, water works, airports, health facilities, etc. Culture would be relatively primitive. For another instance, security from all sorts of fears would be aggravated. The feeling that allows you to plan ahead. To motivate you to make an effort to make things better. Amongst many other things Ronald Reagan deregulated media resulting in greater concentration of the message senders. He also did away with service requirements and a fairness policy. Broadcasters did what was intended, focusing on profits. News became part of the entertainment package and changed to become part of the profit effort partly through sensationalism and partly through segmenting profitable niches. Globalization has many benefits, but also in some ways generates a race to the bottom. International co-operation is resisted by corporations who prefer to play countries against one another in such areas as wages, taxes, union rules and environmental regulations. Redistributing wealth can boost productivity of the poor through education and nutrition, but of course powerful interests make this difficult. Special interests have gained control of the United States partly because of the power of money. But a disengaged population lets them do it. People do vote for local special interests and then find that at the national level they work in concert to each get what they want. Getting elected has become expensive and requires an almost constant campaign mode. Jeffrey had some concerns on something more important than mere money, that being happiness. Westerners in general live in a consumer society and tend to addictions including gambling and watching tv. He points out that excessive tv watching correlates with social distrust, obesity, and low civic engagement. He uses Buddha and Aristotle, both advocates of moderation as the key to fulfillment. We can apply mindfulness to self, work, knowledge, other people, nature, the future, politics and the world. One point that caught my attention was that Europeans generally pay more taxes, but enjoy a higher quality of life in many regards. America have a geographic advantage of more space per capita. 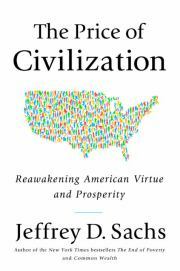 To learn more about Jeffrey Sach look here http://jeffsachs.org/ I recommend any of his books for depth of thinking. We like to think our decisions are all based on a serious weighing of all the facts. That is not true for any of us. We do not have time so we rely on habits and information supplied to us. There is a strong scientific consensus regarding Global Warming, however not much constructive action. The two authors, Naomi Oreskes and Erik Conway are both involved in the history of science. 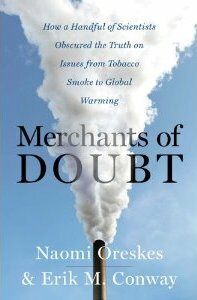 Meeting at a conference they noted that climate deniers were very much like those who denied links between tobacco smoke and cancer. They decided to explore the matter and discovered that many of the same people were involved in several scientific controversies and used the same strategy. The basic strategy was not to disprove a contention but to cast doubt. If nothing else they succeeded in delaying any government response. Most of their efforts eventually were overturned. Many media platforms have a policy of balanced reporting. Both sides of an argument are given equal weight, rather than as authors suggest is giving accurate weight to both sides. It often appears as if there is a lot of controversy amongst scientists, when in fact regarding climate change there is very little disagreement. It seems that scientific researchers often discover inconvenient truths that disturb those who have found a comfortable position in the status quo. Scientists do quarrel amongst themselves and often form opposing factions. They do have a system for determining what is valid. Peer review is taken seriously and anyone can identify those who have participated in the review. The people who have participated in denying, such as Robert Jastrow, Frederick Seitz, William Nierenberg and S Fred Singer have all distinguished themselves in science, but not in the field they were contesting. It might be easy to attribute their motive to money, but in fact there was an important political element. Many of them at the beginning were anti-Communist and saw themselves taking part in the battles of the Cold War. They also tended to be against government regulation and believed that the market would solve all problems. They fought against tobacco smoke causing fatal diseases and second hand smoke also causing fatal diseases, CFC causing ozone depletion, acid rain, DDT restrictions,and now global warming. Money was invested in anything that suggested tobacco was harmful or if other scientific concerns should be regulated by government. They used public relations efforts and were successful. Obviously economic interests are prominent with these issues, none more than energy. The economic interests need some scientific support to maintain their business plans, but they do not need to disprove anything, just cast doubt. They quote John Maynard Keynes that there "is no such thing as a free lunch." Many people relate that notion to actual financial costs, but the authors point out that mankind has been living off natural resources and haven't really paid the price. A definition of conservative might be they like the status quo. Change is frightening. Usually they are invested in the present system and do not want to risk any adjustments. The problem is that the world is changing and is likely to change even more. An example of conservative thinking would be people who cite heavy snowfall in an area not experiencing it before as proof that climate change is a hoax. They do not accept that it actually confirms climate change. Warmer water evaporates faster and results in more precipitation, including snow. I am reminded of the fuss surrounding seat belts. The argument of some was that it was their life and nobody had the right to force them to do something they didn't want to. Eventually another argument prevailed and that was that society paid for their resistance. Medical resources were used and often the victims were unable to be productive causing suffering for others including family and employers. The arguments about the freedom of the individual versus the affects on society will always be there. When the issues arise we need a fair way of deciding. 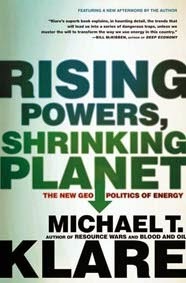 A few weeks ago I finished a book that covered up until just before the 2008 American election, "Rising Powers, Shrinking Planet" by Michael T Klare. It is another of the books that is basically ignored by those who could most fix the identified problems. First contention is that traditional sources of energy are becoming scarcer as more parts of the world are getting more desperate to get their share (really more than their share). Second contention is that while that is going on global climate change threatens to accelerate and the author believes the first problem will take away resources to deal with it. Bottom line is that we as a planet are running out of time, but are oblivious to the problem. I think we have all heard fearful predictions and just rush ahead with our life. There is very little that most of us can do and we can become unsociable by trying to go beyond that. When China and India the two biggest new players in the oil procurement race realized that they were really just bidding up the price when they competed for the same deals. They joined together for their mutual benefit. Michael had suggested that this pattern should be expanded to include research and manufacturing co-ordination with the ideal partners being United States and China or China and Japan. During the Cold War when fears of nuclear conflict were at their highest Russia and United States took steps to cool things down with Summit meetings. Now would not be too soon to start summits over scarcity of energy resources that would also allow greater efforts for the alternatives. The second book, "The Race for What's Left" brings the readers more up to date. Most of the easy hanging fruit of energy has been taken. In the second book Michael Klare discusses minerals and food, recognizing that they are also under pressure.. Some examples. In Afghanistan the Chinese have bought mineral rights, but Americans are resentful. In the Arctic global warming is melting ice, but creating ice bergs and five nations are taking steps to grab as big a share as possible--United States, Russia, Canada, Norway and Denmark. The Chinese by undercutting, and avoiding environmental constraints cornered the market on essential rare earth minerals and then cut off Japan who had offended them. Russia cut off Ukraine from gas supplies in the winter. Food is now part of the diminishing resources. Saudi Arabia has bought large tracts of land in 'Ethiopia to safeguard future food supplies. They are not nearly alone. China has bought up farming land in several African nations. They offer a sweet deal to the national government, both of whom overlook the people that are already using the same land (without recognized land deeds). China, United States and Russia have found that offering military arms gives them the inside track. Corruption seems to follow many deals. The leaders at the top take the cream and those at the bottom are often boxed in more securely than before. Part of the deal often includes military and police weaponry. The Chinese boast that they do not interfere with the internal politics of those countries they do business with, but that is very hollow. They usually knowingly reinforce the established status quo. Corruption seems to be the norm in many countries coming into sudden oil/mineral wealth. It does not flow to the people. Corporations are struggling against one another. Nations are becoming more and more involved in negotiations. Russia discouraged one international company by suddenly enforcing environmental laws that had been ignored allowing Russians to take back. Michael T. Klare uncovers for me geo political stresses that I was unaware of. He believes that more and more future geopolitcal news will reflect the results of fights for resources or disasters because of desperate searching for resources. I believe him and expect that more of the news that will dominate our medium will be resource and environment oriented. Do we just absorb the information or do we do something? My father originally assigned me to check out our family tree at the time of my grandmother's funeral, catching me off guard. I accepted the challenge and later became obsessed by it. With a few lucky breaks and a lot of effort I uncovered over 10 generations of some branches including some celebrity connections. A satisfying outcome for sure, but along the way there was a shock that came from an unexpected revelation. My shock was not unpleasant, just totally unexpected. Watching "Finding Your Roots" on PBS I am conscious that many people have a past they are totally unaware of so it started me reflecting on my own past. There were a lot of flukey incidents that led to the surprising information. Job and residential changes were critical. I grew up in Oshawa, finished high school in Haliburton, went to university in Guelph, got my first job in Barrie and then settled in Burlington where I met my wife's family. For a brief time three of us lived in Kitchener and then came back to the Burlington area and now live in Hamilton. For a few years I worked in Toronto where I first went through Mormon records and census information. A little later I got to talking to a fellow worker, Diane Houston who lived on the far side of Toronto. She recognized a name I had mentioned and pointed out that the Markham museum had a lot of records regarding that name. I phoned the museum and arranged to spend a few hours one afternoon. The name was Raymer and before too long a curator brought out long lists of charts that were organized on clothing hangers. She had a lot of them and I went through many of them. I was amazed at the size of the families and of the ages attained. I was able to extend the family tree back a few generations. I learned later that most of these records had been done by a dental patient where my wife worked in Burlington. At some point the curator brought out a book of local history she had edited and started to show me some photos and the official stories. I noticed something odd. Around where she was directing me were some references to Mennonites. She then informed me that all the charts I had been looking at were for Mennonite settlers in the area. I was stunned. When I had first accepted a job in Kitchener on an impulse I had driven north to watch the horses and buggies and the quaintly dressed occupants that were common there. I have to admit to being very amused and shamefully even laughed. It wasn't that I looked down on them so much as they were so obviously different from what I was familiar with. When my wife and daughter (not quite one year old) moved in we enjoyed visiting St Jacob's and going to the Stone Crock, a well known Mennonite restaurant. We enjoyed it, especially with our daughter Heather who developed a liking for the apple cider (definitely non alcoholic). I think this is where I developed a fondness for shoo-fly pie. We bought an art book by Peter Etril Snyder with heavy emphasis on Mennonite life style. We also bought a print of his which still hangs on our wall. At this point we respected and were interested in Mennonite culture. There were some repercussions from this new knowledge. My Grandmother Coakwell was aware of the connection, but had never brought it up to me (she married into it rather than was a blood relation). My Uncle Harold came across an old photograph that he thought would be interesting for me. It was of the 200th anniversary of the Raymers in North America (around 1938). Several of my already known relatives in the photo were pointed out to me. My mother was about 8 years old with a wide brimmed hat on in the front row. My Aunt Ruth was in there, and my Uncle Harold. Also my Grandmother and Grandfather Marshall Coakwell. I can still easily find my mother, but the rest are more difficult. When I visited the museum again the same photo was there. I learned a little Mennonite history. After the American Revolution, Mennonites in Pennsylvania were concerned about being forced into the American army. They sent out some of their members to scout possible new locations to farm. Some went to the Waterloo area where they prospered. Others went to the Markham area, but not nearly enough. Within a few generations they found many of their members marrying outside their religion. Mennonites can be very strict in their religion, but they have one belief that I respect. They do not baptize their children until they reach a maturity enough to decide for themselves. They do have a high tolerance for outsiders. I made contact with a genealogical group in Pennsylvania and filled a few more spots on my lineage. It was common in Waterloo and elsewhere to refer to Mennonites as Pennsylvania Dutch, but in fact most of them were German or Swiss. Americans found it easier to think of Deutsch speakers as Dutch. Earliest known Mennonite ancestor was a Johann Michael Rohmer. He was father to Abraham Rohmer who married Magdalena Groff who was sister to the second Mennonite Bishop sent to Upper Canada to Markham. Abraham and most of his family left in 1807 in a Conestoga wagon, but were held up in Buffalo, New York before reaching Markham (a section named Mount Joy in honour of their homse base in Pennsylvania) in 1809. They changed the spelling of their last names to Raymer and Grove. A son, John married Esther Hoover (previously Huber). In 1836 their son, Martin married Sussanah Noble (herself descended from Americans who had fought in the American Revolution and thus outside the Mennonite church). In a visit back to Waterloo with my young son, Michael who might have been somewhere between 5 and 10 I visited a Mennonite information site. All this time I had felt a bit sorry for them thinking us outsiders looked at them as some sort of historical freaks. I was surprised to learn they don't see it that way. They have made a choice and are happy to let everyone know and recognize that choice. In a later job I worked with horse people. At different points I talked with Mennonite business people. They were respected as tough business people and realistic evaluators of horses. They were very computer literate, but did not drive cars. They would befriend non members for rides. I remember approaching one Mennonite in particular with no warning and his back was turned to me. When he turned around he immediately addressed me by name even though he had last met me briefly several months previous. At another point I was dealing with Home Hardware and was able to visit a few of their annual supplier sales. Home Hardware had its roots among Mennonites and still very naturally had ties to the members. I hope to tell more stories of my ancestors. It is important to remember that all our stories of ancestors reveal our commonalities as well as our uniqueness. EASTERBROOK'S, A LONG WEEKEND TRADITION. It began as a challenge. Could we make it? Was a foot long hotdog incentive enough? That is how some traditions begin. We don't have a cottage or enough money for long weekend trips so we make the most of the opportunities. 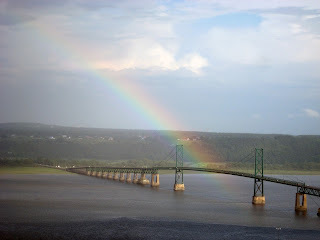 I came to the Burlington area about 40 years ago and for awhile lived with my sister and her husband Terry. Terry introduced me to Easterbrook's. A bit later I met my wife to be and as it happened with Burlingtonians she was already familiar with Easterbrooks. After getting married we moved around a bit for about five years before settling down in Hamilton. I admit that over time I gained weight and certainly lost conditioning. At one point my wife remembered she liked going to Easterbrook's and calculated that with the new Harbourfront trail it would be challenging, but something we could manage. I wasn't so sure, but had reached a point where a challenge was just the thing I needed. A long weekend with nothing planned seemed like a good time to try. We made it and were quite proud of ourselves. The footlong hotdog with fries tasted pretty good and the trip back was not as quick as the trip there. Over the last decade or so we have tried to go on a long walk with some sort of reward in the middle. It wasn't always Easterbrook's, but somehow we did keep turning back. I am sure we have made the trip at least twenty times. The challenge within a challenge. Easily the hardest part of the shorter route. Actually the walk shows off Hamilton pretty good. Normally we walk along the Harbourfront Trail where you can see geese, swans, gulls, cormorants and occasionally herons. A longer variation is to go by Dundurn Castle. Sometimes we have taken the Durndurn route to avoid the High Level staircase which is a challenge within a challenge. From the High Level bridge you get a fantastic view of Hamilton Harbour on one side and Coote's Paradise on the other. As you get close to Easterbrook's you pass by parts of the Royal Botanical Gardens. Our route is very similar to the route taken for the Around The Bay Road Race, although not nearly as long does contain some of the most challenging hills. The rabbit is from my wife, Sharon who took a much better one than I ever did. The War of 1812 is commemorated in grounds adjacent to Dundurn Castle. Most traditions don't start off as challenges, but some of the best ones do. Easterbrook's gave us the incentive. Easterbrook's has it own traditions and draws a lot of ordinary people, but also a lot of celebrities you can see photographed on the wall. The big draw is the wide variety of footlong hotdogs they provide. My daughter Heather decided she wanted to go to Kings College in Halifax and we were not able to dissuade her. Nobody in our combined families had ever been to the Maritimes. It was decided that I would take furniture in my car while my wife and daughter flew to the Halifax Airport. One of my bosses agreed to share some of the expenses if I was able to sell in the Maritimes. We had only a token reach through existing wholesalers, so my first trip was pioneering. I did some research and eventually got a new wholesaler in the Maritimes and in the meantime one of our Ontario wholesalers expanded in a big way to the Maritimes, Eventually we got more distribution channels to the east coast. On my first trip to the Maritimes I studied a map very closely trying to pick the shortest route between logical sales calls. I wanted to make a call in Windsor, Nova Scotia at a tack store. I chose a short cut off of the Trans Canada Highway. The road brought back memories of where I learned to drive in Haliburton county in Ontario with its hilly and curvy roads. An irony was that Windsor was a long time residence of Thomas Chandler Haliburton, an early Canadian humourist who was the inspiration for the name of Haliburton County. Over a five year period making two trips a year dropping off stuff and picking up other stuff, sometimes including my daughter. I took different routes and covered most of New Brunswick and Nova Scotia. I found Maritimers on the whole more welcoming than elsewhere. Many of the people I called were not inundated with sales reps and looked at my visits as a source of information. As I was further from home, I stayed at more motels and ate at more restaurants and got to know things. One prospect at a tack store near Fredericton I spotted at a equine trade show in Ontario over a few years. I questioned him why they always made an effort to make the trade show. I was told "we want to tell our customers about new things, instead of them telling us." The desire for information was evident in most of my calls. As I like to do with all new places ahead of time I read up and try to soak in some of the culture. At one point I read a history of Halifax by Thomas Raddall, expecting to be numbed by a lot of boring details. I was surprised by the number of interesting things that had happened in Nova Scotia and was even more impressed with his style of writing. It turned out that he was really a novelist who decided to write some local history. I ended up buying a lot of his novels, finding them easy to read and full of unexpected history. Music is also an important part of my enjoyment. I discovered Gordie Sampson (even saw him in Hamilton) and Natalie McMaster. I discovered Rawlin's Cross, a band with a bagpiper and greatly enjoyed "MacPherson's Lament." My daughter made me aware of the Great Big Sea. 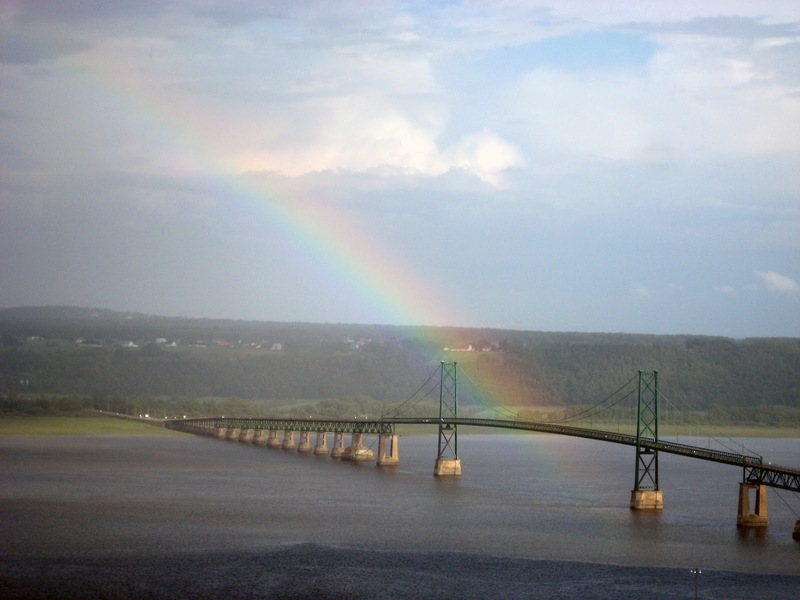 Made being in the Maritimes more pleasurable and helped remind me when I was elsewhere. Halifax is one of my favorite cities. One story I tell a lot is when you are walking down one side of a busy street and just thinking about crossing cars will stop in both directions to make it easier. I spent time on both sides of the harbour and visited many restaurants. Heather introduced me to Donairs (which I recently re-discovered in Burlington). I will admit that I also bought a McLobster. Halifax was a base for much of my sales travels while my wife enjoyed her vacation and helping our daughter get settled. Loads of restaurants. My first trip to Jack Astor's was engineered by Heather and a few years later I learned it is managed by the son of one of my Ontario contacts. We saw Shakespeare outdoors. I went around the coasts of Nova Scotia and found a lot of enjoyable scenery. I was able to drag my wife around to some of it. Mahone Bay with the three churches, Lunenberg, designated a UNESCO heritage site, Liverpool (former residence of Thomas Raddall), Yarmouth, Digby and Wolfeville. One trip I remember coming back with my daughter when a lens popped out from my glasses. With a long trip we couldn't wait to see a local optician who weren't open just yet so I let my daughter drive to the town of Truro where I got my glasses fixed. At that point I decided I would rather navigate and prepare for my sales calls. Heather was not too pleased about the stops for sales calls, but she liked driving and we shared radio stations. I made my last sales call in Edmundston and decided I would do the driving to my sister's in Brossard. It was late and Heather had been driving all day. The next morning I decided to let my daughter drive and she got stuck with the Montreal rush hour starting with the Champlain Bridge. I made a few calls in Quebec, but mostly in Ontario. When we got to Toronto she again got rush hour traffic. A little later to get her licence the tester asked if she had any highway driving and she explained she had driven from Halifax to Hamilton and without much further testing she got her licence at a time when passing was not so easy. Another trip with Heather I took her to see Grand Falls in New Brunswick which had been of some interest to me, but this time there was hardly any flowing water. The impression I had hoped to make on my daughter was not quite what I had expected. I learned later that water had been diverted for irrigation. I took her over the longest covered bridge in Canada in Hartland, New Brunswick. . I read about Oak Island in my efforts to learn more about the Maritimes. A fascinating mystery. There is something buried there with all sorts of booby traps that have centuries later prevented unwelcome visitors from solving the mystery. My favorite theory was that treasure was proof that Shakespeare's plays were really written by Roger Bacon. The Templar Knights were said to have secrets. Another interesting theory was that it contained the booty from a raid on Havana, Cuba. Now it is behind a no trespass sign. I stayed at a nearby Motel (within view) twice. On one occasion I got a luxury room at a discounted price as it was off season. I only visited Prince Edward Island once and covered it all in one day. I took the ferry boat and left by the Confederation bridge. The roads were mostly two lane and pretty much rural. Red soil was very prominent. I remember two other things. The ice cream was exceptionally good and the people were the friendliest anywhere on any of my travels. My favourite drive anywhere is Cape Breton. The first time I decided to do a big loop taking the old highway to Sydney and coming back on the new modern highway. Both were very scenic. At one time the ocean was on one side and Lake Bras d'Or on the other. I have to say Sydney did not impress me very much, but I had a very pleasant encounter. Years before I had sold over the phone some advertising specialities to a local radio station and they were so glad of my unannounced visit they gave me a special diary book. On the way back I had to stop at Baddeck knowing it was where Alexander Graham Bell had flown the first airplane in Canada. Looking at the Lake Bras d"Or I can appreciate why he chose to live there. My second favorite drive was through an area of Quebec called Matapadia that started in Mont-Joli and continued to Campbellton, New Brunswick. On one trip I stayed overnight after being told not to drive late at night for danger of moose. I had never thought about them before, but have paid much more attention in Quebec and northern Ontario without seeing a moose except once. When you look on a map or listen to news what you get is all along the coast. The big question became what is in the middle of Nova Scotia? One of my sales calls was to Caledonia right in the middle and funnily enough there was a lumbering museum right near where I made my call. The answer is trees. My daughter made the decision to go to King's College. In some ways it was a problem, but I am so glad for the opportunities to see a part of Canada previously unknown to me. The whole family eventually became more aware of Nova Scotia. I regret I didn't even know about digital cameras for most of my Maritime visits. There is so much beautiful scenery.